Hiring, training and retaining the right people are all essential for running a successful business. The people who excel at HR and recruitment are very perceptive judges of skills, character and the often-nebulous criterion 'best fit'. This is usually the result of careful attention to the job specification: establishing the requirements and agreeing their relative importance, then accurately assessing applicants on every aspect. Extracting a good job specification is a skill in itself. Managers may have a concept of the ideal candidate, yet find it difficult to express; or they may omit to mention vital aspects because they consider them ‘obvious’. And if more than one person is involved in the hiring it is even trickier, especially if a senior decision-maker is not going to be present at the interviews. Evaluating applicants is demanding too, relying in the early stages on Resumes (CVs), previous work (if available) and perhaps personal recommendations from trusted sources. Face-to-face interviews can be even trickier: social bias (or “beauty contest syndrome”) can take over, so the interviewer chooses the person (s)he likes most, almost regardless of other factors. This is the basis of the oft-repeated statistic that interviewers decide within 5 minutes (sometimes less!) whether to hire someone. While this sometimes works out well, it can cause problems later… and it may even have brought down empires! 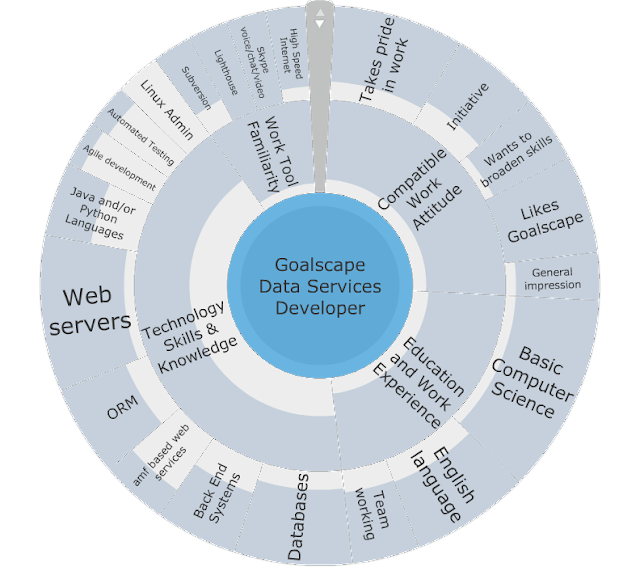 With Goalscape anyone can easily produce a ‘smart’ job specification that precisely matches all the key requirements. Because it is extremely fast, all the decision-makers can be involved at an early stage to ensure that nothing vital is omitted and everyone agrees what makes the ideal candidate. The manager makes a first draft that covers the specific skills and experience profile for the role. Senior managers can contribute their ideas – perhaps to check that candidates’ personal goals align with corporate goals or to express a preference about experience in areas not directly related to the role. Even the team members can contribute to the final specification: team cohesion is vital. Crucially the Goalscape representation incorporates an agreed assessment or the relative importance of each skill, experience and personality trait. This automatically applies a weighting to the candidates’ scores in each area. The screenshot below is a real job specification, which we posted on the web when we were looking for a Data Services Developer. 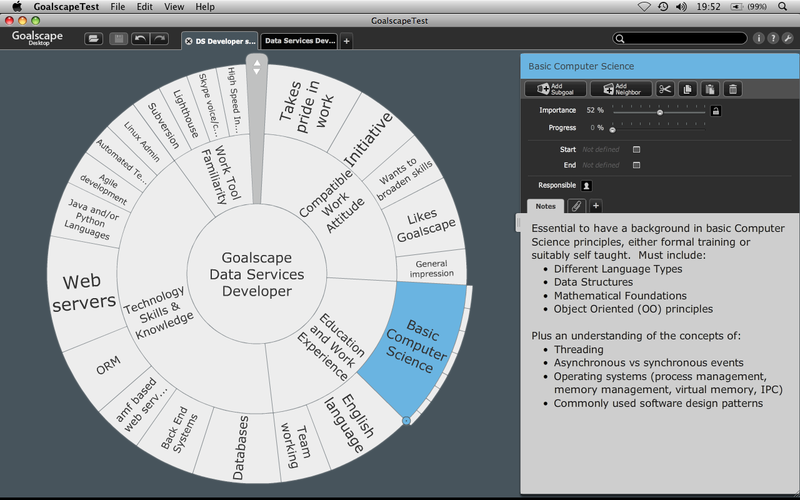 In this screenshot the ‘Basic Computer Science’ skill is selected, to illustrate the additional detail in the Notes field. Note that each element has its own section under this skill, each with its own relative importance set. The interviewers enter the applicants’ scores for each skill (either on the basis of written submissions and test scores, or interview, or both) as Progress. In producing the overall rating (ie Progress in the Main Goal), Goalscape automatically applies the agreed weightings. So the person with the highest overall score just is the best candidate, according to the agreed specification! This supports an analytical approach and reduces the influence of social bias. 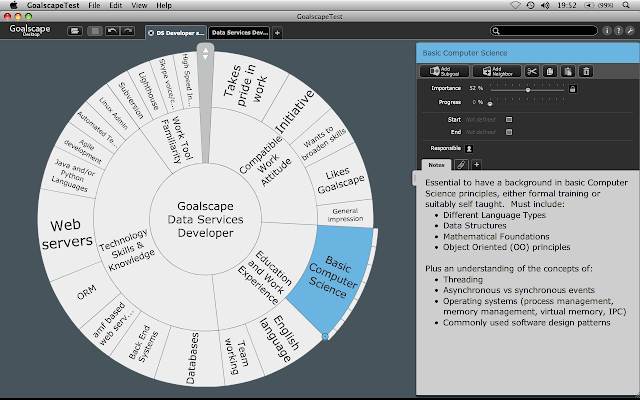 Below is a screenshot of the completed goalscape for the successful applicant (who has since been extremely successful in the role). Mindjet might just put the others out of business!! Words escape me regarding what Mindjet are attempting to accomplish with their latest acquisitions and extremely intelligent moves to absolutely corner the visual information management market. The others (competing developers) may indeed be placed into panic mode with the realization they may not be able to compete with the FREE offerings and new acquisitions of Mindjet. Via the entry level Free offering of Mindjet Connect (Thanks for being reborn) with 1GB of data load, and yes I'll say it again; it's FREE. No excuse ever needed for not experiencing the absolute power of visual information management in and through MindManager any longer. Mindjet shall exponentially grow their user base through Mindjet Connect. And I do believe many users of Connect at the Free level shall indeed migrate to the business and corporate subscription models for more functions, capabilities and security in the cloud. Oh! and the mobile editions associated with MindManager are now FREE too. The Desktop versions for both PC and Mac are the inevitable destination for many who shall experience the Free entry level to Mindjet Connect; and the Acquisition of Cohuman; a social media and team building/management product is ingenious, and this in due course shall be integrated right into the MindManager suite. And need I say; this will be FREE too. 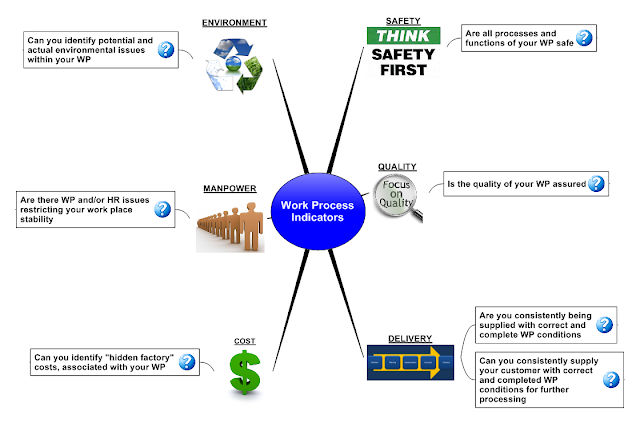 MindManager desktop is a rather expensive product to own, but the serious visual information managers of this century shall indeed brush that issue aside; as the implications and power realized from adopting and infusing MindManager into personal, academic and business environments shall be more than mere finacial cost of having this excellent product. Personally I'm still trying to get my very small brain around the implications of this ingenious move by Mindjet; so maybe this collage will inspire you to delve a little deeper into the upcoming changes to the apparent unbeatable leader and innovator of visual information management software and services. Point of view, perception, side, angle; they all mean perspective, and I’m sharing mine. The mind mapping arena has been good to me; from my perspective, I call it visual mapping and I’ve used the name Visualmapper to define my persona within the visual mapping arena. My angle has been one of using multiple formats (Visual mapping) compared to using a single format (mind mapping); visual mapping includes but is not limited to mind mapping and other formats such as concept mapping and flow charts. Whether you’re happy with using a single format or multiple formats, it’s all good as far as I perceive this arena; no problem whatsoever, or is there? From the perspective of software development; the mind mapping arena is somewhat successful. Regarding software names and capabilities; Mindjet, CS Odessa, Simtech, MindGenius, NovaMind and Xmind are a few that deserve to be applauded for their software development work. Many not mentioned here; they simply clone what the leader such as Mindjet have developed and many indeed make themselves irrelevant to the furtherance of this so called arena, by way of their apparent cloning activities. And if the “other” developers merely have cool functions that add up to maybe a timeline or a different brainstorming capability; hmm, me thinks this arena needs a shakeup altogether. Who the F**k do you think you are? You may be thinking this if you’re one of the “other” developers. Well; I’ve been involved within the information management scene for some time, my genesis being within industry. I’ve used and abused quite a few information management products over the past 25 years, some are excellent and some are not so excellent. From my perspective; the software mind mapping development arena is without a doubt indebted to Tony Buzan for giving them the initial seed of development motivation. Many software products though have struggled to get past the perception (by potential users) of the “stuck in a time warp” traditional mind mapping philosophy developed by Mr. Buzan. A note of recognition also goes to ThinkBuzan; the developers of a truly Buzan approach to software Mind mapping. 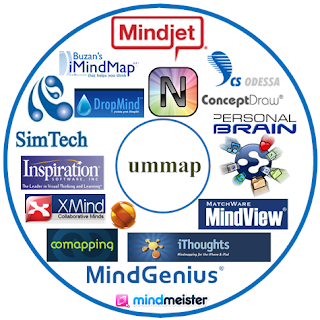 I’m personally not a Buzan mapper; yet I do have the utmost respect for what Mr. Buzan initially formalized, and for what it has become in and through the ThinkBuzan flagship product named iMindMap. 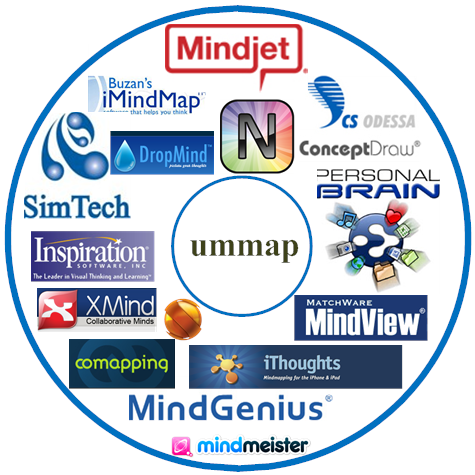 The landscape though, certainly is not pretty regarding the plethora (over abundance) of software products that have unashamedly claimed to be mind mapping product. It really is such a shame to see these other developers merely hijack mind mapping as an SEO advantage. But; hey its business and these other developer have the right to develop their angle on the traditional Buzan approach to Mind mapping. Apart from what I view, use and write about; I certainly perceive the mind-visual mapping arena to be an arena based merely on what the developers create and release as viable product. This product may (or may not) be effectively used within the mainstream information management economy. A note about the “information economy”; it’s real and tangible by the way we have aggregated data into information and further contextualized into usable knowledge. Information/knowledge has become the commodity of business success. The monetary value (ROI) of the data-information-knowledge evolutionary (development) process has indeed been realized through many people, academics and organizations becoming aware of the power of becoming visual information managers; in and through the use of the tools, methods and Mindset of Visual mapping IMO. There’s a conundrum (puzzle) though; and it’s one relating to why we haven’t experienced a more wide mainstream acceptance of the tools, methods and Mindset of mind-visual mapping. After all; most developers offer really good, capable and effective tools for creating, managing and exchanging (monetary value) data-information-knowledge processes. The gap between fringe (where many approaches initially live) to mainstream may be read as a chasm. I personally engage with many of the mind-visual mapping developers, and I must say the majority are definitely most giving and open; when it has come to giving me and the rest of my fellow colleague’s access to their excellent product. There has been though; an obvious lack of engagement from the developers to the user base (Voice of the Customer); and this has raised its ugly head as discontent (from a user perspective) towards the mainstream developers that cries “WTF are you developing; we didn’t ask for this”. So it seems to me (my perspective) that we’ve certainly arrived at an impasse of sorts between the users and developers. This impasse has been revealed by the developers focus on merely competing with their perceived nearest competitor. This competitiveness is certainly not bad; yet it does seem to have thwarted further relevant development (evolution) of the needs of the voice of the customer (user base). There are indeed devotees of specific software packages, and I certainly understand this sentiment. I have a couple of products I simply need to be effective, capable and competitive within the information management arena. My specific point of view would be one of challenging all developers to take a closer look at their own product and asking a few cutting question such as; are we merely cloning the perceived leaders capabilities and functions, or are we creating functions and capabilities that are enabling a quantum shift in the human condition relating to information/knowledge management. If you’re not enabling a shift in the way we humans create, manage and exchange data-information-knowledge; well I would challenge you to consider pressing the pause button and re-examining your positioning within this so called arena. Merely my perspective and I would be pleased to publish your perspective. The challenge before us was complex. The 49er was a new class of boat that hardly anybody could handle and we had very little experience to build upon. We also knew we would have to take our racing skills and our physical fitness to completely new levels, as well as learning to sail the boat. And on top of all that we had organized everything ourselves and raise the money for what to many seemed like a 4-year holiday. Of course the reality was a lot of hard work with long days and plenty of ups and downs. It was intense, but very rewarding because we were really focused on our shared dream goal – and we loved to sail the boat for hours at a time, day after day. My first goalscape chart covered only the boat handling area, a specific part of sailing that is particularly important in the 49er class. Being able to actually SEE the challenge like this certainly helped us to be better organized and to improve faster in our sailing: we climbed to the top of the world rankings and qualified to represent our country at the Olympic games. So we achieved our first major goal!